The strongest zero-turn riders in their class don’t come along fast or easy. We dedicated over 40,000 hours of engineering, design and testing to perfect the PRO Z 100 series. With direct feedback from landscapers across the country, we didn’t just remake the zero-turn, we redefined the category. All to enable you to go above and beyond with the best zero-turn rider for the professional. THE POWER OF KOHLER® COMMERCIAL-GRADE ENGINES: High-performance, maximum-power Kohler® engines provide greater torque. Along with a heavy-duty air filter filtration system that ensures a longer engine life, you'll be cutting with confidence year after year. CUSTOM LAP BAR DESIGN: Oversized lap bars with quick-adjust knobs, full-length comfort grips and integrated automatic parking brake system reduces operator fatigue. 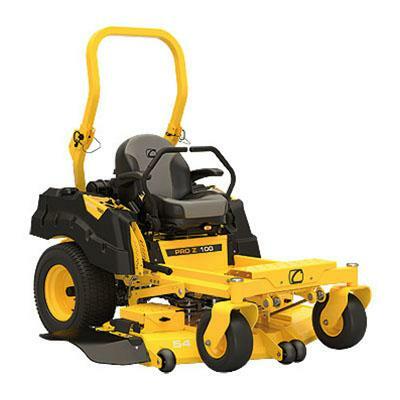 UNBEATABLE RESULTS - THE CUB CADET SIGNATURE CUT™: The PRO Z 100 L Series features a sloped-nose, triple-blade floating fabricated deck. The 10-gauge reinforced leading-edge, trim-side discharge opening and consistent blade tip speed evenly disperse grass clippings for pristine, professional-grade results. Warner Clutch - 125 ft lb.